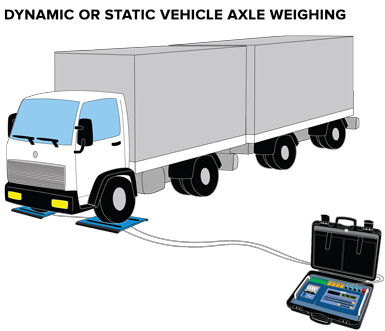 Software for axle weighing system. - Manual axle weighing and totalization. - Automatic static axle weighing and totalization. - Automatic dynamic axle weighing and totalization. - Checking the weight of the vehicle with printing of the axle and overall total weighs. - Axle totalisation with input/output function. 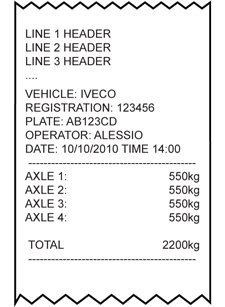 Input/output weighs' storage through ID CODE or VEHICLE PLATE(up to 999 suspended weighs). Fully configurable keyboard functions according to customer requirements. 15 configurable and printable ID texts containing each 32 characters (example: Code, Lot ID, operator ID, shift number, etc.). Database of 500 customers, each with three 25-character descriptions. Database of 500 articles, each with two 20-character descriptions. Database of 500 vehicles, each with a 10-character value of the plate,a 20-character alphanumeric description, and a linked tare. 6 levels of re-settable and independently printable totals: partial total,general total, grand total, customer total, article total and vehicle total. Dinitools also simplifies the creation of new weighing systems and allow to quickly restore the original configuration.